We continued our reading of "Utopia or Oblivion" Chapter on "Prevailing Conditions of the Arts". 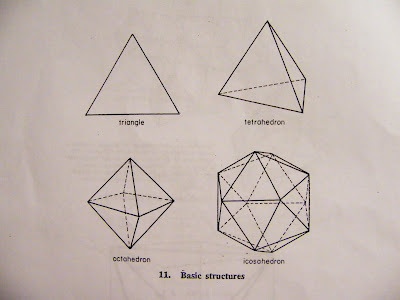 In brief, the basic shapes in nature are: triangles, tetrahedrons, octahedrons and isocahedrons, as shown below. 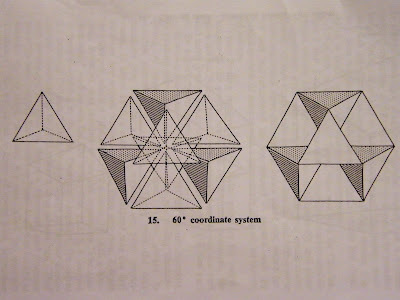 These are natures systems of structures because they are the most efficient, and Bucky demonstrates how it is most efficient but quantifying the volumes octahedrons and tetrahedrons occupy compared to cubes.
. 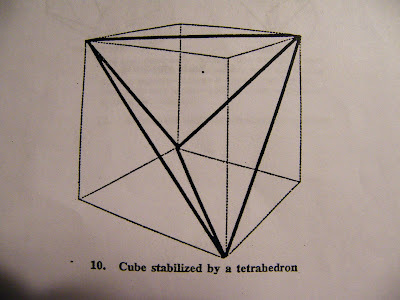 Besides, cubes are actually supported by a tetrahedron inside, as shown in the diagram below. 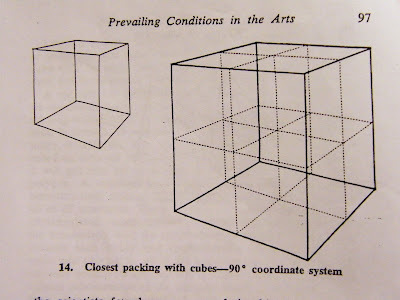 That is, if we imagine that all the joints of the cube is made of rubber, the cube will collapse and not be standing. 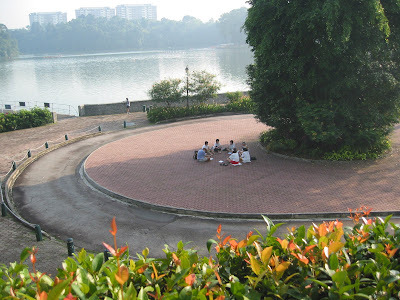 Nature does not like 90 degree structural members, as forces triangulate in nature. This system can represent the fourth-power relationships that the cubic coordinate system cannot. 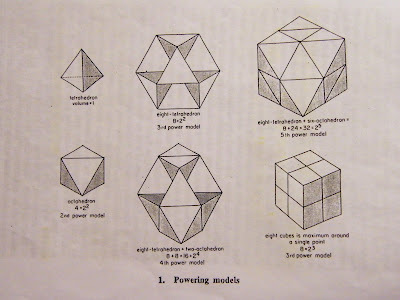 Bucky went on to explain that if we were to consider the basic tetrahedron to have a volume of 1 unit, then the octahedron will have a volume of 4 and the cube will have a volume of 3. That means the cubic coordinate system occupies 3 times that of a tetrahedra-coordinate system. 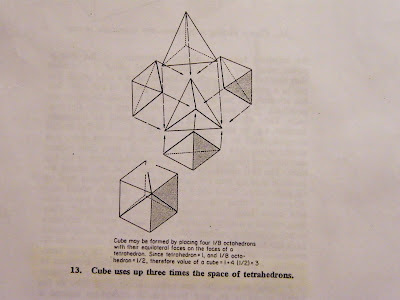 Here's how he demonstrate the relative volume of the cube compared to the tetrahedron. 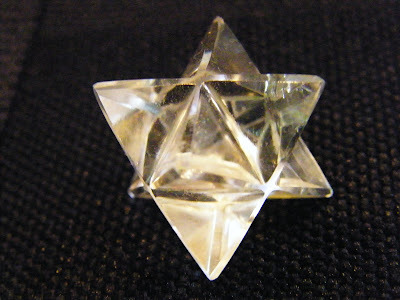 It says that, cube may be formed by placing four 1/8 octahedrons with their equilateral faces on the faces of a tetrahedron. 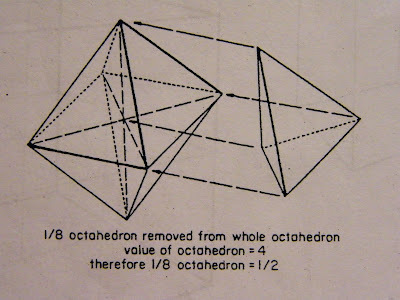 Since tetrahedron = 1 and 1/8 octahedron = 1/2, therefore value of a cube = 1+4(1/2) = 3. When you have smaller cubes and you want to make a bigger cube, you need 8 smaller cubes to make one big cube. When you use 60 degree for your coordination, we can carry out 4th power calculations because there is a volume of 20 tetrahedroa around one point instead of 8. This obviates the need for imaginary or complex numbers in the calculations. Gases have single bond structure and therefore they are very flexible. Two bonds form a hinge, very flexible but quite compact as a system, like water. 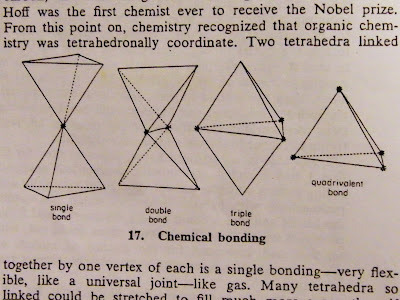 Triple bonding is rigid, like crystals. And quadrivalent bonding are for very densely compacted matter, like diamonds. 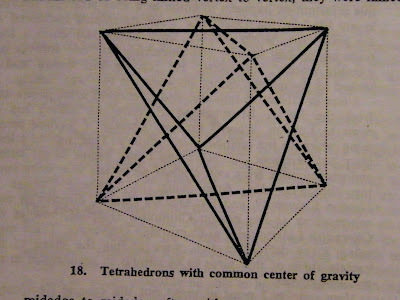 Metals have tetrahedra structures with common centres of gravity, as shown below.